WATER RIDES REMAIN OPEN UNTIL September 22! Don’t miss our ALL NEW fireworks show, set to Sesame Street music! Rock out with Elmo, Abby Cadabby, Cookie Monster and Count von Count, as their music fills the air and the sky is covered with colorful bursts of brilliance. Fireworks will begin immediately following the 8:00pm evening performance of the "Neighborhood Street Party" Parade. Super Why LIVE: You’ve Got the Power! Super Why is coming to Sesame Place for the first time ever! Some special Gabba friends are heading to Sesame Place to jump, shake and shimmy with their friends! 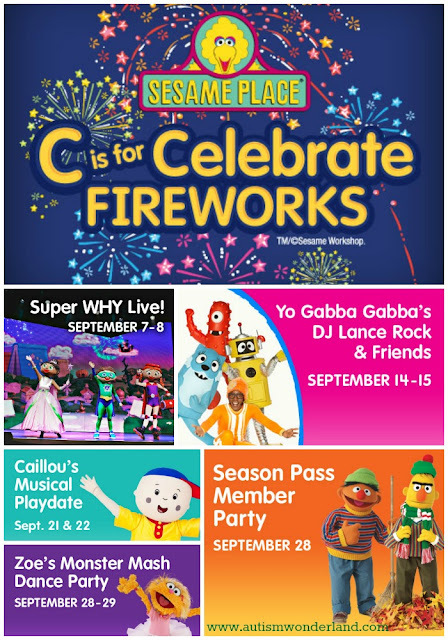 Join Yo Gabba Gabba's DJ Lance Rock and his friends Muno, Plex and Toodee as they get the sillies out at Sesame Place this fall! Growing up is not so tough, especially with a friend like Caillou! The irresistible four-year-old is always up for an adventure and has the most unique way of looking at the world. This interactive live show is packed with dancing and sing-along songs that are guaranteed fun for all! Celebrate Zoe’s Birthday with a Monster Mash Dance Party at Sesame Place! Join Zoe and your favorite Sesame Street Monsters for singing, dancing and an all-you-can-eat buffet! Saturday and Sunday, September 28-29, 2013 at 12:00 p.m. and 5:00 p.m. in Dine With Me! The park is open just for 2013 & 2014 Season Pass Members from 6:00p.m.-8:00p.m. on Saturday September 28th for an exclusive event to kick off The Count’s Halloween Spooktacular! Be sure to pick up your wristband upon entrance to the park to remain after hours for the party. Come dressed in costume and enter to win our Halloween Costume Contest. Prizes will be awarded to the top three Family costumes.